In 2010/11 the RSPB completed small-scale trials to investigate ways of utilising this problematic wetland biomass to make briquettes to be used in domestic heating. This work interested the Department of Energy and Climate Change (DECC) who committed to fund a competition to develop the complete process from wetland harvest through to the creation of bioenergy - entitled ‘Wetland Biomass to Bioenergy’. 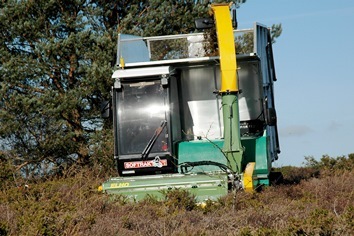 As part of the DECC trial, Loglogic have supplied SOFTRAK 120 and SOFTRAK vehicles to AB Systems, AMW Ibers and Natural Synergies to harvest biomass for the project. The results have been successful and further funding is about to be introduced to further evaluate the results of the project.